West Edgewater Street: Police at 6:56 a.m. on April 3 cited Tyler A. Iverson, 30, of Arena for no front license plate and a sixth offense of operating after revocation. West Edgewater Street: Police at 7:47 a.m. on April 3 cited Sarah T. Owen, 24, of Portage for a third offense of operating after license suspension. New Pinery Road and Eastridge Drive: Police at 3:21 p.m. on April 3 responded to a three-vehicle crash and cited Robert W. Schanzel, 63, of Montello, for failure to keep a vehicle under control. West Cook Street: Police at 8:09 a.m. on April 4 cited Matthew J. Lauer, 47, of Portage for a third offense of operating after license suspension. County Highway X: Police at 7:46 p.m. on April 4 arrested a 47-year-old Chicago female for battery and domestic disorderly conduct. Police also issued a court summons for domestic disorderly conduct and criminal damage to property to a 50-year-old male from Olympia Fields, Illinois. West Wisconsin Street and West Conant Street: Police at 3:40 p.m. on April 5 responded to a two-vehicle crash and cited Brandy M. Chrzas, 27, of Portage for inattentive driving. West Conant Street: Police at 8:17 a.m. on April 6 cited Joseph A. Latz, 29, of Monroe for a second offense of operating after license revocation and not having a required ignition interlock device. Police arrested Latz on four counts of misdemeanor bail jumping. East Edgewater Street: Police at 1:09 p.m. on April 6 cited Jason N. Lancaster, 47, of Portage for a 21st offense of operating after license revocation. Townsend Street and Brady Street: Police at 6:35 p.m. on April 6 cited Shaun Evan Sauer, 37, of Portage for excess display of power and not having valid proof of insurance after he “did a burnout” and left black tire marks in a parking lot while several other people watched. West Pleasant Street: Police at 8:03 p.m. on April 6 issued a court summons to Kortney M. Lisser, 34, of Portage for two counts of felony bail jumping. Volk Street and West Haertel Street: Police at 10:39 p.m. on April 6 arrested Michelle M. Zacharias, 25, of Portage for a second offense of operating while intoxicated, a second offense of operating after license revocation, open intoxicants and failure to install an ignition interlock device. Airport Road: Police at 7:47 a.m. on April 7 cited Claudiel Polk Jr., 42, of Portage for a fourth offense of operating after revocation and failure to install an ignition interlock device. Police also arrested Polk on a Sheboygan County warrant. West Pleasant Street: Police at 5:13 p.m. on April 7 arrested a 23-year-old Fitchburg man for disorderly conduct. Jefferson Street and East Conant Street: Police at 2:19 a.m. on April 8 cited Daeqwon A. Booker, 21, of Portage for a fourth offense of operating after license suspension and not having valid proof of insurance. West Franklin Street: Police at 8:20 a.m. on April 8 responded to a report of vandalism of an electrical box and a wall near Rusch Elementary School. Police took photographs of graffiti. Superior Street: Police at 8:30 a.m. on April 8 responded to a report of vandalism at the Columbia County Fairgrounds and observed graffiti spray-painted on gate entrances to the fairgrounds. East Wisconsin Street: Police at 11:14 p.m. on April 8 arrested Lloyd E. Moss, 63, of Madison on a charge of bail jumping after they say he violated a no-alcohol order. Airport Road: Police at 12:58 p.m. on April 9 cited Joe Dudley, 51, of Portage for bail jumping after they say he violated a no-alcohol order. Dudley had been transported to the hospital for a medical emergency. East Collins Street: Police at 1:15 p.m. on April 9 issued three separate truancy citations to three Bartels Middle School students at the request of school staff. Adams Street: Police at 1:28 p.m. on April 9 responded to a report of possible graffiti tagging near the train tracks off New Pinery Road. Officers observed the words “undivided nation” on the side of a building, with some of the letters having been spray painted. Huron Street: Police at 11:37 p.m. on April 9 cited a 17-year-old Pardeeville male for reckless driving and endangering safety a first offense of operating after suspension. An office reported the suspect was trying to evade a traffic stop and was traveling at a high rate of speed. The boy’s mother later picked him up from the police station after he was stopped. Fairfield Street: Police at 9:36 a.m. on April 10 cited Brant E. Kienast, 45, of Baraboo for a fifth offense of operating after license suspension and not having valid proof of insurance. Woodcrest Drive: Police at 11:57 a.m. on April 10 responded to a report from Bartels Middle School staff that a 10-year-old male student threw another student to the ground and pushed a teacher. The boy was suspended from school and referred for disorderly conduct. West Franklin Street: Police at 4:13 p.m. on April 10 referred to Health and Human Services a 12-year-old male for disorderly conduct. 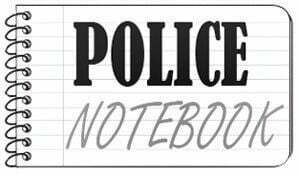 New Pinery Road: Police at 4:57 p.m. on April 10 responded to a report of shoplifting at Walmart and cited Zachary Scott Jahn, 19, of Portage for theft and underage consumption of alcohol.